The Program for International Student Assessment (PISA) is a worldwide educational evaluation of 15-year-old students. PISA is a highly respected program and enables politicians and policy-makers to examine the education system in different countries. The test focuses on reading, mathematics and science. In 2010, the results from the last series of PISA tests were released. It is clear that the United States and United Kingdom need to make some changes in the educational process. South Korea ranked #1 in math and reading, #3 in science. Finland ranked #2 in math and reading, #1 in science. Canada ranked #5 in math and science, #3 in reading. New Zealand ranked #4 in reading and science, #7 in math. The United States ranked #14 in reading, #25 in math and #17 in science. The UK ranks #20 in reading, #22 in math and #11 in science. Students in the UK and US are not being taught the basic fundamentals of space, science, computers, disease, war and the atmosphere. This article will examine ten facts that should be taught in school. People are taught is school that humans have five senses. They are hearing, sight, touch, smell and taste. In reality, people have more than five senses. The number ranges from 9 to over 20. By definition, senses are the physiological capacities in organisms that provide inputs for perception. Senses are feelings that allow you to navigate your environment. In humans, we have a central nervous system, which is made up of the brain, spinal cord and retina. The nervous system has an area dedicated to each sense. Apart from the traditional abilities, humans can sense high and low temperatures (thermoception), balance (equilibrioception), acceleration (kinesthesioception), body and limb position (proprioception) and pain (nociception). Other natural abilities include the sense of time, itching, pressure, hunger, thirst, fullness of the stomach, need to urinate, need to defecate and blood carbon dioxide levels. People also hold a large collection of internal senses. This includes the chemoreceptor trigger zone of the brain which receives input from the blood and communicates with the vomiting center. Cutaneous receptors in the skin not only respond to touch, pressure and temperature, but also other emotions such as embarrassment, which will make your skin blush. Pulmonary stretch receptors are found in the lungs and control respiratory rate. The senses of hearing, sight, touch, smell and taste were originally taught by Aristotle 2400 years ago. I think it might be time to expand the elementary school textbooks and discuss the entire human sensory capabilities. In general education classes, students don’t get taught the basic laws of physics. For this reason, people don’t understand the fundamentals of our galaxy. A black hole is a region of space that holds a gravitational field so intense that no matter or radiation can escape. Black holes exist in the center of most galaxies. In particular, there is strong evidence that a black hole with more than 4 million solar masses is located in our Milky Way. Students should be taught about the world’s advancement in high energy technology. The Large Hadron Collider (LHC) is the world’s largest and highest-energy particle accelerator. It is located in a tunnel at the depth of 175 meters (574 ft) beneath the Franco-Swiss border near Geneva, Switzerland. The collider was built by the European Organization for Nuclear Research (CERN) with the intention of testing various predictions of high-energy physics. It was constructed by over 10,000 scientists and engineers from over 100 countries, as well as hundreds of universities and laboratories. On March 30, 2010, the first planned collisions took place between two 3.5 TeV beams. The result was a world record for the highest-energy man-made particle collision. The Large Hadron Collider will be running at full energy (7 TeV per beam) by 2014. The hope is that the machine will replicate the energy observed in space and answer some important questions. Scientists want to learn about the existence of the elusive Higgs boson particle, extra dimensions and dark matter. Dark matter accounts for 23% of the mass of the universe. Experiments will also be conducted to research why gravity is so much weaker than the other three fundamental forces. On May 24, 2011, it was reported that the quark–gluon plasma (the densest matter besides black holes) was created in the Large Hadron Collider. With a budget of 7.5 billion euros, the LHC is one of the most expensive scientific instruments ever built. The experiments have sparked fears among the public that the device might create a doomsday phenomena, involving the production of stable microscopic black holes. In the last couple years, the collider has become a popular device in science fiction, with people claiming the ability to time travel. Maurice Hilleman is credited with saving more lives than any other scientist in the 20th century. He was an American microbiologist who developed over three dozen vaccines. In 1909, Hilleman was born near the town of Miles City, Montana. His twin sister died at birth, and his mother passed away two days later. In 1941, Hilleman received his doctoral degree in microbiology from the University of Chicago. From 1948 to 1958, he began to research the influenza virus. The 1918 Spanish flu is the most serious influenza pandemic in recent history. During the 1918 flu pandemic, some 550 million, or 32% of the entire world population was infected, between 50 and 100 million died, making the pandemic one of the deadliest natural disasters in human history. In the 1950s, Maurice Hilleman identified the fact that genetic changes occur when the influenza virus mutates, known as shift and drift. The discovery helped him recognize that an outbreak of flu in Hong Kong could produce a huge pandemic in the 1950s. Following a hunch, Hilleman discovered a new strain of influenza. He developed a vaccine for the virus and forty million doses were distributed all over the world. In 1957, Hilleman joined the Merck & Co. research organization in West Point, Pennsylvania. While working at Merck, Maurice developed over forty experimental and licensed animal and human vaccines. In 1963, Maurice Hilleman’s daughter Jeryl Lynn was diagnosed with the mumps. In response, he cultivated material from her, and used it as the basis for a mumps vaccine that is still used today. Maurice Hilleman and his group of researchers invented vaccines for measles, mumps, Hepatitis A, Hepatitis B, chickenpox, meningitis, pneumonia and Haemophilus influenzae bacteria. He also played a role in the discovery of the cold-producing adenoviruses, the hepatitis viruses, and the cancer-causing virus SV40. Maurice considered his work on Hepatitis B to be his single greatest achievement. He ran his laboratory like a military unit and did not name any of his vaccines after himself. “If I had to name a person who has done more for the benefit of human health, with less recognition than anyone else, it would be Maurice Hilleman. Maurice should be recognized as the most successful vaccinologist in history.” He passed away on April 11, 2005, at the age of 85. We need to clear up some common misconceptions. There is no evidence that Vikings wore horns on their helmets. Marie Antoinette, who was the Queen of France and husband to Louis XVI during the French Revolution, never actually used the phrase “let them eat cake” when she heard that the French peasantry was starving. George Washington did not have wooden teeth. They were actually made of gold, hippopotamus ivory, lead, and animal teeth, including horse and donkey teeth. The signing of the United States Declaration of Independence occurred on August 2, 1776, not July 4. Napoleon Bonaparte was not particularly short in comparison to other French men and did not have a Napoleon complex. A common misconception is that you must wait at least 24 hours before filing a missing person’s report, this is not true. Entrapment laws in the United States do not require police officers to identify themselves. Sushi doesn’t mean “raw fish” and not all sushi includes raw fish. If a person swallows chewing gum, it doesn’t take seven years to digest. Chewing gum is mostly indigestible, but it still passes through the digestive system and out of your body. A person who has used LSD more than seven times is not insane. One hit of marijuana doesn’t have the carcinogen effects of an entire cigarette. The largest study of its kind by the University of California found that people who smoke marijuana are no more likely to develop lung cancer than non-smokers. In fact, some studies have shown that marijuana may actually reduce the risk of some cancers by as much as 61%. It is commonly claimed that the Great Wall of China is the only human-made object visible from the Moon. This is false. City lights were the only feature reported to be visible. Seasons are not caused by the Earth being closer to the Sun in the summer. They are the result of the Earth being tilted on its axis. Meteorites are not hot, but cold when they hit the earth. The claim that a duck’s quack doesn’t echo is false. Houseflies do not have an average lifespan of 24 hours. The average lifespan of a housefly is 20 to 30 days. Bulls are not enraged by the color red, which is used in capes by professional matadors. The movement of the fabric is what irritates the bull and causes them to charge. Shaving doesn’t cause hair to grow back thicker or darker. Hair which has never been cut has a tapered end and after cutting the hair the taper is lost making the new hair sharp. Alcohol doesn’t make a person’s body temperature warmer. Eating less than an hour before swimming doesn’t increase the risk of experiencing muscle cramps or drowning. Drowning is often thought to be a violent struggle, where the victim waves and calls for help. In truth, drowning is often inconspicuous to onlookers. The instinctive drowning response doesn’t show prior evidence of distress. Creutzfeldt–Jakob disease (CJD) is a degenerative infectious brain disorder that is incurable and fatal. CJD is commonly referred to as mad cow disease, because the bovine spongiform encephalopathy virus is believed to cause the disease in humans. In a person with Creutzfeldt–Jakob disease, the brain tissue develops holes and forms a sponge-like texture. This is due to a type of infectious misfolded protein called a prion. In CJD, prions replicate in the brain. The first symptom of the disorder is dementia, leading to memory loss, personality changes and hallucinations, accompanied by speech impairment, jerky movements, balance dysfunction, changes in gait and seizures. Most victims die within 6 months of diagnosis. Other prion diseases include Gerstmann–Straussler–Scheinker syndrome (GSS), fatal familial insomnia (FFI) and kuru. 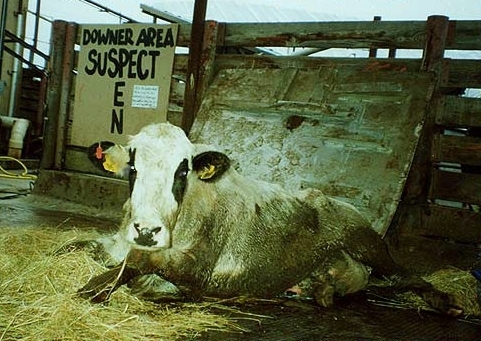 Humans can contract CJD by consuming material from animals infected with the bovine form of the disease, such as cows. In a more alarming statistic, a 2004 report published in the Lancet medical journal showed that CJD can be transmitted via blood transfusions. The discovery alarmed healthcare officials because a large epidemic of the disease could result in the near future. In response, the UK government banned anyone who had received a blood transfusion since January 1980 from donating blood. On May 28, 2002, the United States Food and Drug Administration instituted a policy that excludes all blood donors who spent at least six months in certain European countries (or three months in the United Kingdom) between the years 1980 to 1996. In New Zealand, anyone who has lived in the UK, France or the Republic of Ireland for a total of six months, between 1980 and 1996, is prohibited from donating blood. The FDA has also banned the import of any donor sperm to the United States, motivated by the risk of Creutzfeldt–Jakob disease. The world population is yet to experience a major outbreak of CJD in humans, but research conducted at University College in London has suggested that the symptoms of Creutzfeldt–Jakob disease might take 40-50 years to become visible. It has been discovered that similar diseases that involve the spreading of prions, such as kuru, have a long incubation period. If true, humanity could experience a major outbreak of CJD in the future. This would be detrimental, as the disease would spread via blood transfusions and artificial insemination procedures. As of 2011, no generally accepted treatment for CJD exists. It is invariably fatal and research continues so we can understand the threat posed by the disorder. The history of World War II that is presented in American high schools is limited. Mandatory classes should be provided to explain the war and its impact on world affairs. We will examine one specific operation that was undertaken during World War II that helped defeat Germany and the Axis Powers. In 1938, nuclear fission was discovered by a German chemist named Otto Hahn. Nuclear fission is the reaction needed to produce nuclear power and weapons. Hahn is regarded as “the father of nuclear chemistry” and the “founder of the atomic age.” By 1939, Germany had developed an advanced nuclear weapons program. They had a nuclear reactor and facilities used for the production of uranium and heavy water. They also performed uranium isotope separation. During World War II, it became a high priority for the Allied troops to disrupt the German nuclear program. The Norwegian heavy water sabotage was a series of actions undertaken by Norwegian soldiers during World War II to prevent the Nazis from acquiring heavy water (deuterium oxide), which could have been used in the production of nuclear weapons. In 1934, the Norwegian company Norsk Hydro constructed the first commercial plant capable of making heavy water as a byproduct of fertilizer production. The plant was located at Vemork power station at the Rjukan waterfall in Telemark, Norway. Prior to the German invasion of Norway on April 9, 1940, some of the heavy water was removed, but a large supply remained after the Nazi occupation. A Norwegian resistance movement was developed in order to sabotage the nuclear threat. In early 1943, Operation Gunnerside was carried out by the Allied troops. During the attack, a team of SOE-trained Norwegian commandos succeeded in destroying the production facility with explosives. The ground mission was followed by a series of Allied bombing raids. In response, the Germans elected to cease operation at the facility and remove the remaining heavy water to Germany. Upon retreat, Norwegian resistance forces sank the SF Hydro on Lake Tinnsjo to prevent the heavy water from being removed. In retrospect, the operation has been labeled the most successful act of sabotage in all of World War II. It helped stop the production of Nazi nuclear material. People should learn about the history of cyber warfare. Cyber warfare is the politically motivated hacking of a network in order to conduct sabotage and espionage. Large organizations have been put together to study cyber attacks. Stuxnet is a computer virus and the most complex malware ever written. The worm targets industrial software and equipment. It spies on industrial systems and infiltrates them. Stuxnet is the first malware to include a programmable logic controller (PLC) rootkit. Stuxnet is designed to target Siemens Supervisory Control and Data Acquisition (SCADA) systems. These symptoms are configured to control and monitor specific industrial processes, such as the production of nuclear material. In 2010, different variants of Stuxnet were discovered in five Iranian organizations. The primary target of the attack was a uranium enrichment facility at Natanz. After the virus was discovered, the Russian computer security firm, Kaspersky Lab, speculated that the cyber attack could have only been conducted “with nation-state support,” such as that held by Israel and the United States. Gary Samore, White House Coordinator for Weapons of Mass Destruction said, “We’re glad they (the Iranians) are having trouble with their centrifuge machine. We, the US and its allies, are doing everything we can to make sure that we complicate matters for them.” The Stuxnet virus was initially found in Iran, Indonesia, and India, but it has since spread across the world to Azerbaijan, Pakistan and the United States. Unlike most malware, Stuxnet targets computers that hold specific configuration requirements. The virus is programmed to erase itself on June 24, 2012. Stuxnet can be used as a weapon. It contains code for a man-in-the-middle attack that fakes industrial process sensor signals. This causes an infected system to not shut down properly when abnormal behavior is detected. It prevents operators from identifying problems, such as a nuclear core meltdown. The virus directly attacks the coolant rods of a nuclear reactor. In an interesting coincidence, the reactors located at the Fukushima Power Plant in Japan use Siemens’ controllers. During the earthquake of March 11, 2011, three of the six reactors at Fukushima did not properly shut down. The behavior is consistent with a Stuxnet infection, which damages system controllers. The Holocene extinction refers to the current mass extinction of species during the Holocene epoch. The Holocene is a geological epoch which began 11,700 years ago and continues to the present. It represents the expansion of the human race, including all written history. The epoch has been characterized by a large number of plant and animal extinctions, most notably mammals, birds, amphibians, reptiles and arthropods. Based on the species-area curve, it has been estimated that approximately 140,000 different species become extinct per year. Many of these are tiny organisms. However, the Holocene extinction includes the disappearance of large mammals, known as megafauna. The cause of the Holocene Extinction has been attributed to global warming, pollution, and human influence. There is currently no general agreement on whether the event is part of Earth’s natural cycle of evolution. A collection of scientists have estimated that the current extinction levels may be 10,000 times higher than the normal historic rate. Research based on archaeological and paleontological digs on 70 different islands in the Pacific Ocean have found evidence that thousands of different species have become extinct due to human expansion. This includes the moa-nalo, which was a goose-like duck that lived on the larger Hawaiian Islands. In Madagascar, eight or more species of elephant birds have become extinct, as well as the Malagasy aardvark and 17 species of lemur. In the Indian Ocean, several species of giant tortoise have become extinct on the islands of Seychelles and Mascarene. Some examples of large animals that have become extinct during the Holocene epoch include the auroch (large cattle), tarpan (wild horse), thylacine (carnivorous marsupial), quagga (species of zebra), the Steller’s sea cow, Falkland Islands wolf, Atlas bear and the Eastern cougar. Top officials are aware of the situation and currently 189 separate countries are part of The Convention on Biological Diversity (CBD) treaty. The treaty was developed in order to create national strategies for the conservation of biological diversity. A near-Earth object (NEO) is a Solar System body that has an orbit which brings it within proximity of the Earth. NEOs include a few thousand asteroids, comets, a number of solar-orbiting spacecraft and meteoroids. Since the 1980s, near-Earth objects have become of interest to scientists because of the potential danger some of the asteroids or comets pose. As of 2008, two near-Earth objects have been visited by spacecraft. They are 433 Eros and 25143 Itokawa. 433 Eros is the second-largest near-Earth asteroid after 1036 Ganymed. Eros has a maximum diameter greater than 10 km. and has entered the orbit of Mars. In 2001, the NEAR Shoemaker probe landed on the surface of 433 Eros using maneuvering jets. Comet C/2010 X1 (Elenin) is a long-period comet discovered by amateur Russian astronomer Leonid Elenin on December 10, 2010. Comet Elenin will come to perihelion (closest approach to the Sun) on September 10, 2011. On October 16, 2011, the comet will reach its closest point to the Earth. It has been showed that the comet has a heliocentric orbital period of 600,000 years, but being on a highly eccentric orbit, the comet will be frequently perturbed by the planets as it leaves the inner solar system. Using the JPL Horizons On-Line Ephemeris System, the comet shows a semi-major axis of approximately 11,700 years. This is quite alarming as the Pleistocene epoch on Earth ended 11,700 years ago. On December 25, 2004, an asteroid named 99942 Apophis was assigned a 4 on the Torino scale, the highest rating so far. On December 27, 2004, there was a 2.7% chance that the Earth would be impacted by Apophis on April 13, 2029. Since that time, the risk of impact with the asteroid has dropped to 0% for 2029, but, a possibility remains that during the 2029 close encounter with Earth, Apophis will pass through a gravitational keyhole and set up for a future impact on April 13, 2036. Currently, the only known near-Earth object with a Palermo scale value greater than zero is (29075) 1950 DA, which is predicted to pass very close to or collide with the Earth in the year 2880. Humanity has been preparing for the day an asteroid impact becomes inevitable. A gravity tractor (GT) is a spacecraft that deflects another object in space using only its gravitational field to transmit the required impulse. Everyone reading this article is familiar with the fact that cancer causes human death. Cancer is a heterogeneous class of diseases. It forms the uncontrolled growth of cells in the human body. Once active, the cells can intrude upon and destroy adjacent tissues. The tumors spread to different locations in the body via the lymphatic system and the bloodstream. The rates of cancer related deaths and diagnosis are growing. In 1904, it was reported that only 1 in 24 people were diagnosed with cancer. In 2008, 1 in 2 men and 1 in 3 women were given a diagnosis of cancer. The statistics are impacted by the discovery of DNA analysis and improved medical technology. More than 50% of the population will be diagnosed with cancer during their lifetime. A recent press release by the health charity Macmillan Cancer Support found that 4 in 10 people in the UK will get cancer. Currently, 1 in 4 deaths in the United States is due to cancer. In 2011, it was projected that a total of 1,596,670 new cancer cases and 571,950 deaths will occur. In the United States, the overall cancer rates have been stable in men over the past couple years. In women, incidence rates have been declining by 0.6% annually since 1998. Cancer rates for individuals in poor neighborhoods are more than twice that of the wealthy. In the early 1900s, cancer of the lung was practically nonexistent in the world. Women who smoke are more than twice as likely to develop lung cancer as men. According to a 2008 report published by the World Health Organization, there will be approximately 20 million new cases of cancer a year by 2030, up from 12 million.